It stings when fact isn't as funny as fantasy. Soon after we asked social media followers to share whimsical or wacky captions for this Campus Martius scene, snapped around 7:30 a.m. Friday by an office worker who shares this photo and asks to be identified only as Mike, witticisms began flowing. So did reality checks. 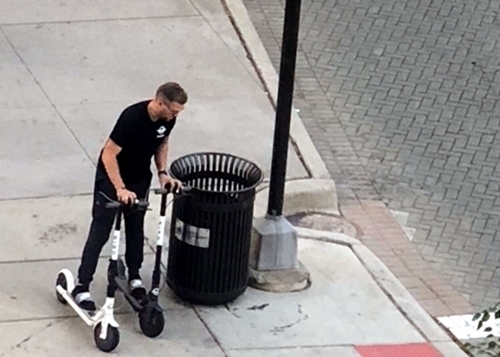 So yes, we now know what looks like scooter stunt-riding is actually a user -- or, more likely, a company rep -- returning two Birds to a nest recarging dock. Thanks to Jack Roskopp, Jason Prone, Amelia Deschamps, Daniel Tanner, Cheryl Anderson and Meg Sabula for sending truth when we sought mirth. No hard feelings, honest. A normal user on Woodward Avenue between Campus Martius and Spirit Plaza. "What scooter-hogging wizardry is this?" asks the headline above a post wondering if he's "like a goddamn Greek god." Interesting vacant dead end side street next to the freeway near Corktown.